MySQL Enterprise Audit: "[ERROR] Plugin 'audit_log' init function returned error"
130228  2:39:50 [ERROR] Plugin 'audit_log' init function returned error. 130228  2:39:50 [ERROR] Plugin 'audit_log' registration as a AUDIT failed. When the audit log plugin opens its log file, it checks whether the XML declaration and opening root element tag need to be written and writes them if so. When the audit log plugin terminates, it writes a closing tag to the file. If the log file exists at open time, the plugin checks whether the file ends with an tag and truncates it if so before writing any elements. If the log file already exists but does not end with or the tag cannot be truncated, the plugin considers the file malformed and fails to initialize. This can occur if the server crashes or is killed with the audit log plugin running. No logging occurs until the problem is rectified. Login to the MySQL service as a user with the SUPER privilege. Delete and re-install the audit plugin. Verify that the audit log file /var/log/mysql/audit.log was recreated and that new MySQL connections are being logged to it. ERROR 1123 (HY000): Can't initialize function 'audit_log'; Plugin initialization function failed. >INSTALL PLUGIN audit_log SONAME 'audit_log.so'; ERROR 1123 (HY000): Can't initialize function 'audit_log'; Plugin initialization function failed. Hopefully, it will complete successfully this time. 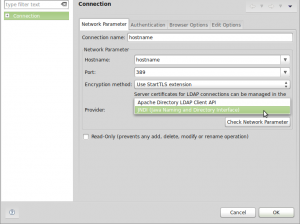 Apache Directory Studio "LDAP: error code 13 – confidentiality required for update"
Note that “confidentiality” means a TLS secured connection. 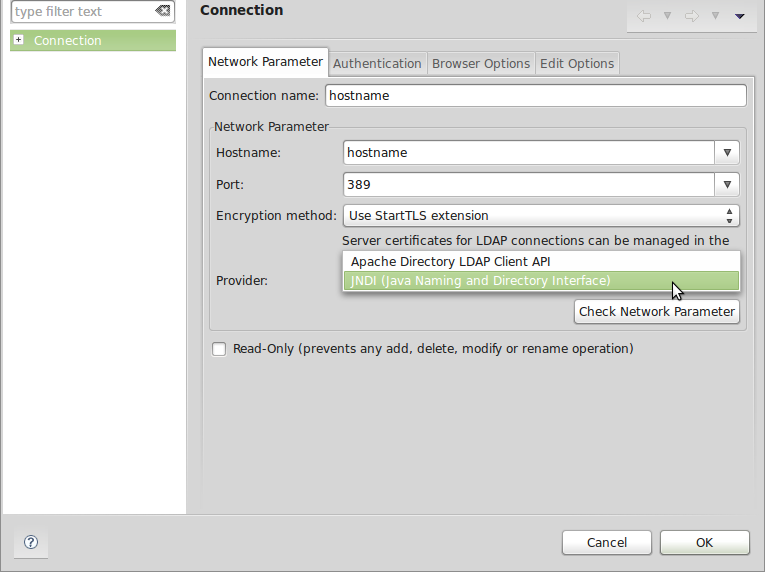 I resolved this problem by changing the Provider setting for this connection from “Apache Directory LDAP Client API” to “JNDI (Java Naming and Directory Interface)”. However, I am not entirely certain as to why this resolves the problem. Configure Ubuntu to output more verbosely to the screen at boot. # Remove the kernel parameters "quiet" and "splash"
# Remove the kernel parameters "quiet" and "splash" GRUB_CMDLINE_LINUX_DEFAULT=""
to create a new /boot/grub/grub.cfg file. Configure CentOS 6 to output more verbosely to the screen at boot. Have GRUB display the menu interface. GRUB will still automatically boot the default entry, unless interrupted. Modify the GRUB configuration file /boot/grub/grub.conf. Comment out the line that contains “hiddenmenu”. Modify the GRUB configuration file /boot/grub/grub.conf. Remove the kernel parameters “quite” and “rhgb” from each kernel entry. “quiet” causes the kernel to not print out messages while the kernel loads. “rhgb” enables the Red Hat graphical boot after the kernel loads. You may see this as a logo being displayed to the screen and a progress bar. This is all you need to do. Unlike Ubuntu, you do not need to run a script such as update-grub. Future kernel package updates will not add the “rhgb” and “quiet” kernel parameters back. After each execution of aide, the mtime and ctime on these directories are changed. Hence, aide detects and reports these changes. This is due to prelinking. If you disable prelinking, then this problem will go away. To disable prelinking, modify the configuration file /etc/sysconfig/prelink. Change “PRELINKING=yes” to “PRELINKING=no“. Then manually run /etc/cron.daily/prelink as root. After updating the aide database, subsequent aide checks will not have this problem. # aide --version Aide 0.14 Compiled with the following options: WITH_MMAP WITH_POSIX_ACL WITH_SELINUX WITH_PRELINK WITH_XATTR WITH_LSTAT64 WITH_READDIR64 WITH_ZLIB WITH_GCRYPT WITH_AUDIT CONFIG_FILE = "/etc/aide.conf"
Google Authenticator implements TOTP (timebased one-time-password) security tokens from RFC6238 via the Google mobile app Google Authenticator. The Authenticator provides a six digit one-time password users must provide in addition to their username and password to login, sometimes branded “two-step authentication”. Here, we install and configure a pluggable authentication module (PAM) which allows login using one-time passcodes. Before configuring SSH, first set up Google Authenticator. Run “google-authenticator” as the user you wish to log in with via SSH. You will be prompted with a few questions. These settings are stored in the user’s ~/.google_authenticator file. Copy and paste the URL into your browser and scan the QR code that is displayed with the app Google Authenticator on your mobile device. If you can’t scan the QR code, then you can enter the information manually with the given secret key and verification code. A new verification code should be displayed every 30 seconds. Emergency one-time use verification codes are also given for you to write down in a secure place in case you were to not have your mobile device with you. Have PAM require Google Authenticator for SSH authentication. Modify /etc/pam.d/sshd and add the line “auth required pam_google_authenticator.so” at the top. This will require all users to use Google Authenticator for SSH authentication. To only require those users with Google Authenticator configured for their account (the ~/.google_authenticator file exists), then instead enter “auth required pam_google_authenticator.so nullok“. The order in which you place items in this file matters. Given this configuration, you will first be prompted for your Google Authenticator verification code, then for your system account password when you SSH into the system. If you have any problems, look in the /var/log/secure system log file. Jan  3 23:42:50 hostname sshd(pam_google_authenticator): Failed to update secret file "/home/username/.google_authenticator"
See here for additional information on this issue. This assumes your local network is subnet 192.168.0.0/24.